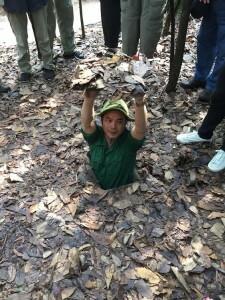 In Vietnam, our tour guide told us, they call winter the American Season. This is when well-heeled baby boomers come to see a country that figured so large in much of their youth. Some also come to see what has happened to country that they last saw under battlefield conditions. What they find is a “communist” country in throes of entrepreneurial high spirits. Not a wealthy country by any means, but one becoming prosperous with a GDP growth rate of over 7%. The city streets are lined with small shops and choked with motor scooters. According to the Ministry of Transport, the country has 45 million motor scooters for a population of 92 million people. But what of the war, what of the past? In Hanoi out of country tourists crowd into the Maison Centrale, the notorious Hoa Lo Prison Museum. Today sharing its site with a tall apartment block. Photographs of famous residents (Senator John McCain) and visitors (President Clinton) are on display. Somber exhibits tell the history and horror of the prison built by the French during the colonial regime. Hanoi is also the place to visit the soviet style tomb of Ho Chi Minh as well as his modest residence. Located on the grounds of the former colonial government compound, the house was built in the style of a peasant’s stilt house and is Gandhi-like in its austere simplicity. For most Americans though the most vivid images of Vietnam are all below the 17th parallel – China Beach, Da Nang, Hue, the Mekong Delta, and of course Saigon. Now officially called Ho Chi Minh City, but everyone still calls the bustling upscale city center by its former name. First on the list of the city’s historical sites is Independence Palace also so known as Reunification Palace. Architecturally it is an unlikely political symbol of revolution. 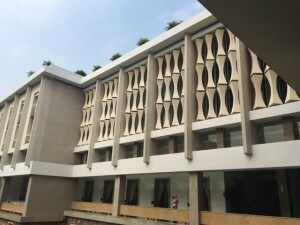 This very modernist structure was commissioned in the 1960s by South Vietnamese President Ngo Dinh Diem on the site of the former French Governor General Residence. The original residence was destroyed in 1962 in an assassination attempt on Diem’s by his own air force. Diem then commissioned this new residence, but was actually assassinated before it was completed. And it was here in 1975 that North Vietnamese tanks pushed through the building’s gates ending the long war. Just this short recounting of the building’s past, is a lesson in the complex history that is Vietnam. Today the building has been carefully preserved with each of the official rooms telling a different story of foreign and in particular American involvement in the war. The fact that the building and its furnishings were not looted during the transition of power tells another story about the discipline of the transition. Finally, the residence’s richly furnished living quarters tell one more tale. A tale of the of the opulent life style of South Vietnam’s leaders, quite a contrast to Ho Chi Minh’s stilt house in Hanoi. 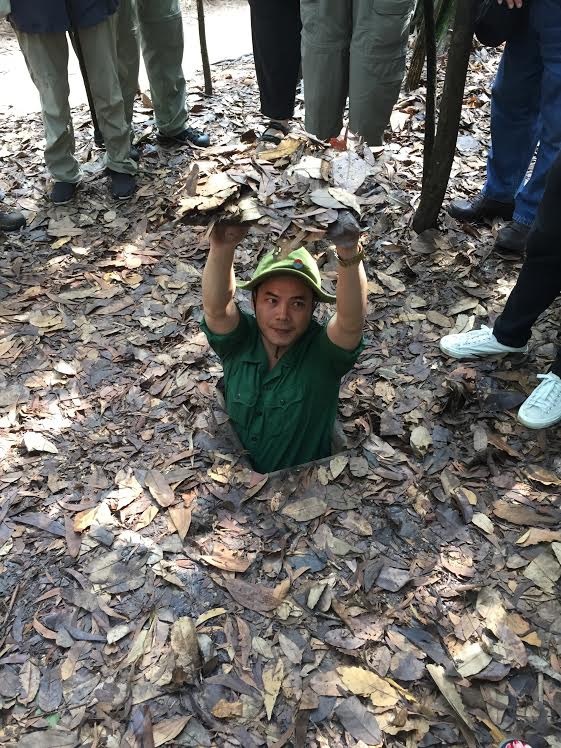 The other must do site especially for foreign tourists is a visit to Cu Chi Tunnel complex. These tunnels, now symbols of resistance, were originally begun during the period of the French occupation. 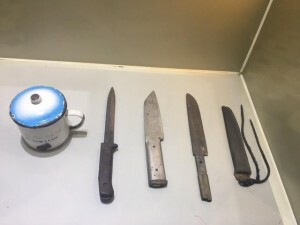 The complex includes some of the original tunnels many with entrances widened to admit the larger size of out of country visitors as well as reconstructed kitchens, displays of armaments, and tanks, and gruesome exhibits on the range of booby traps. Providing additional verisimilitude, is the constant sound of gun fire from the nearby National Defence Sport Shooting Range. There for $1.50 a bullet you can shoot weapons such as machine guns and M-16s, which in the site’s brochure is billed as part of the sites recreational and entertainment services. 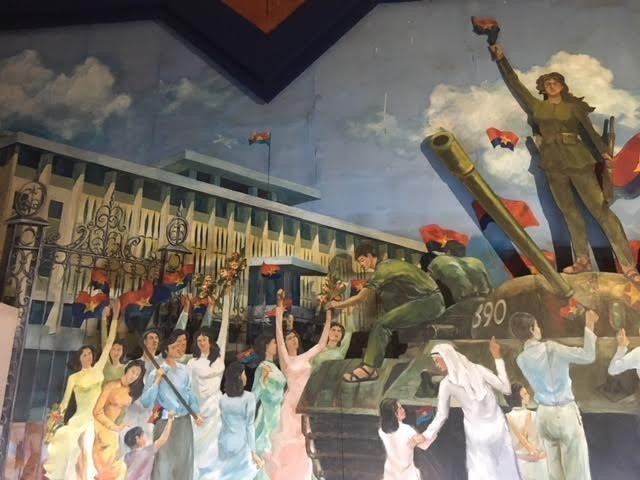 The final stop on my personal American War tour of Vietnam was a visit to the Ho Chi Minh City Museum until recently known as the Revolutionary Museum. 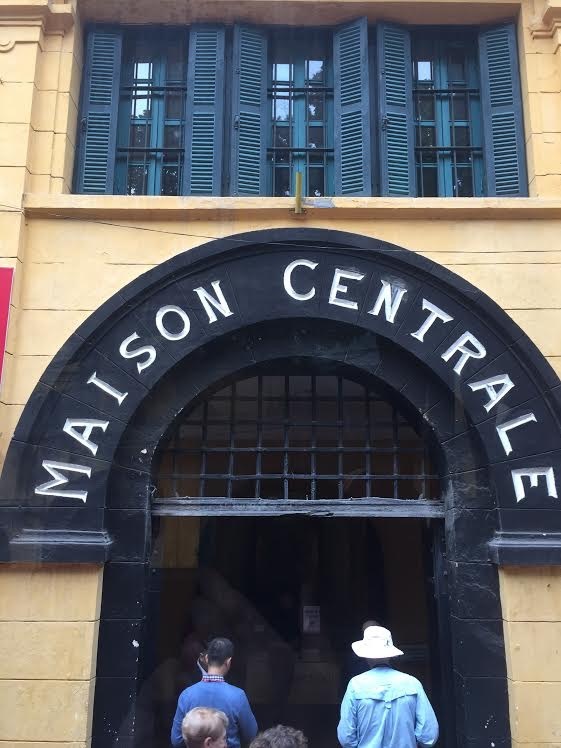 The building housed in, a French Colonial neoclassical building from 1886, has its own complex story. It served as the headquarters of the French Governor, then the Japanese occupation, and even as a temporary residence for the ill-fated President Diem. Today the museum’s first floor displays antiquated exhibits of Vietnamese industry, geography and archeology. Upstairs there are only slightly more updated exhibits of the Vietnamese people’s resistance to theFrench, the Japanese, and finally the Americans. 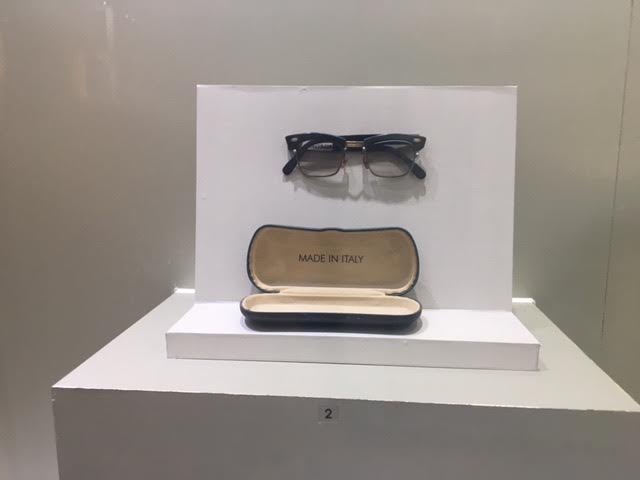 The artifacts are the plain and touching remnants of the revolution: reading glasses, typewriters, and mess kits. The story is a continuum of struggle against outside forces from three continents. And one more vignette: Seeking to escape the building’s atmosphere of humidity and dignified decay as well as a sudden rain shower, I headed to a coffee shop on the grounds of the museum. 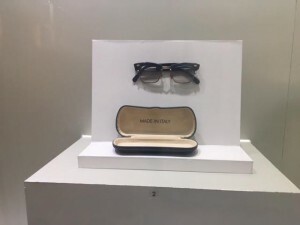 Opening its big glass door, I walked into a different world- air-conditioning, gleaming brass fixtures, the whoosh of expresso machines, and a crowd of young Vietnamese sipping lattes and working on laptops. No reason to look any further, welcome to Vietnam today.